The first pictures of Aussie David Johnson with his carbon-fibre framed Tyco BMW HP4 Race have emerged at the Ulster Grand Prix. Johnson competed at this year’s North West 200 and Isle of Man TT in iconic Gulf colours with Shaun Muir Racing, but will switch to the Moneymore-based TAS Racing effort for next week’s races at Dundrod. Taking two fourth places at this year’s TT aboard the SMR machine, the Aussie heads to the Ulster GP on good form. This time last year he achieved his best ever result around the 7.4-mile Dundrod course with fourth place in the Superstock race. 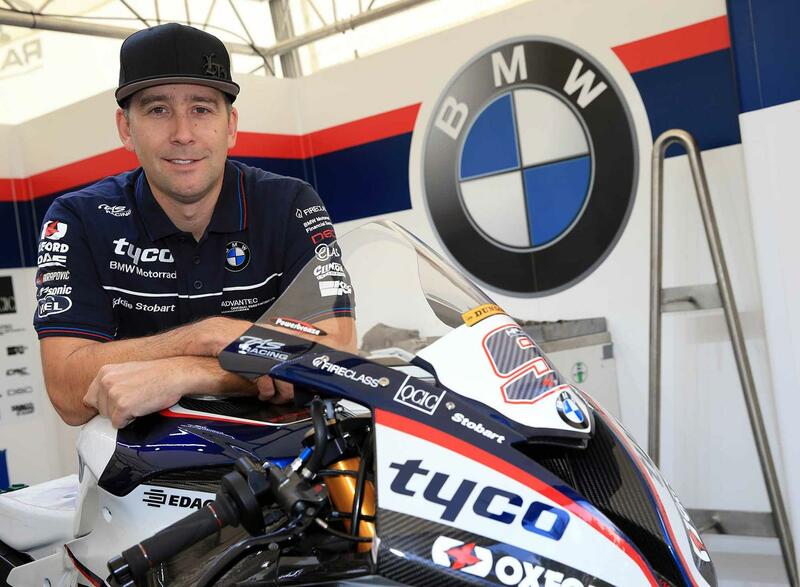 It will mark the first time the Tyco BMW squad have run their carbon-framed, 215bhp HP4 machine. It is not yet known whether Michael Dunlop will appear at the event with the Tyco BMW team. The 18-time TT winner hasn’t raced since the death of his brother William at Skerries last month.